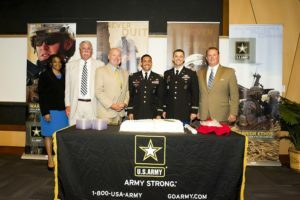 Brad Cole Construction Company (BCC) has entered into a strategic partnership with the US Army through its US Army Partnership for Youth Success (PaYs) Program. The PaYs Program is a unique program designed to prepare, train and connect Soldiers to future employers. PaYs Soldiers are guaranteed a job interview and possible employment after the Army with their chosen PaYs partner. The PaYs Program aligns with the US Army Marketing and Research Group’s mission to reconnect America with its Army. 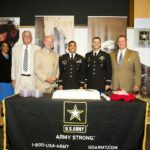 On July 13, 2016 Brad Cole Construction and the Atlanta Recruiting Battalion held a formal signing ceremony at the University of West Georgia. Honored attendees included Brad K. Cole, Founder and President of BCC, LTC Luis A. Parilli the Atlanta Battalion Commander, members of the Army, Mark Albertus, Carrollton City Schools Superintendent, members of the Carrollton community, eight Jr. ROTC members and several BCC employees. Also in attendance was Senator Mike Dugan, who was instrumental in putting this partnership into action. Executive Vice President of BCC, Ron Cryer, offered a few words to explain why it makes sense for Brad Cole Construction to partner with PaYs to assist Soldiers entering the civilian workforce. To begin he spoke to the similarities between BCC and the military; we spend large sums of money on material assets including construction equipment, GPS technology and computer software. Cryer continued, “None of that matters, unless the people using those things are properly trained and motivated to effectively use them. People make the difference.” He stressed that the BCC vision statement simply states, “We want to be a company where our employees find fulfillment, our customers find complete satisfaction and our community benefits from our existence.” There is no better group of people to help BCC realize its vision statement. These military veterans have been trained, tested and proven all while having a servant’s heart. BCC is proud and honored to partner with the US Army PaYs Program!